Ria has surrounded herself with western classical music ever since she was a child. She started playing the piano at the young age of 3. She has also learnt the violin, the guitar and drums and is currently learning the cello. Academically, she is pursuing a degree in Psychology. 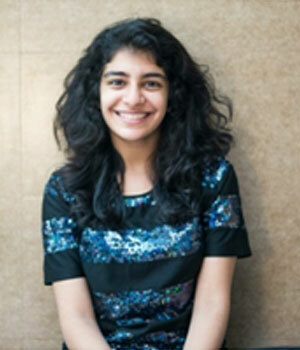 Ria is an integral part of, and one of the youngest members of, the prestigious Paranjoti Academy Chorus. Having been a student of the Mehli Mehta Music Foundation for 10 years herself, she deeply understands the value of music in every walk of life. What she loves most about the Discover Music programme is the joy of working with young children and watching them grow and develop. Her love for music further extends to working with Songbound, an NGO which provides early music education to underprivileged children. Ria hopes to pursue a career in Child Psychology and in Music Therapy.